Radical changes in security have dramatic impact on load balancing. SSL/TLS is changing so rapidly that enterprises are forced to do a forklift upgrade of their hardware load balancers. However, with Avi's software load balancer, it’s as simple as a version update. In this webinar, we will catch you up the latest SSL facts. - SSL termination can be done with only software. And it has better security, scalability, and lower cost. That’s how Facebook and Google do it. Let’s see how. - RSA and Elliptic-curve cryptography (ECC) have different implications for perfect forward secrecy (PFS), HTTP/2 and TLS 1.3 support. Let’s compare. - SSL health score allows you to manage expiring certificates, automated certificate renewals, and notification alerts from a centralized control plane. Learn how to integrate with Google Kubernetes Engine (GKE) and deliver multi-cloud application services consistently. Azure Kubernetes Service (AKS) is offered by Microsoft Azure as a fully-managed Kubernetes orchestration service. Learn how to secure your modern web applications for continuous delivery, and how to solve the challenges proposed by integrating a modern web application firewall (WAF). Modern applications have evolved from monolithic architectures to distributed microservices, but now require availability, security, and observability across multiple data centers and public cloud. Avi Networks extends Istio into a universal service mesh, while bringing consistent enterprise-grade features for both traditional and cloud-native applications. - Enhance Istio ingress gateway with rate limiting, blacklist/whitelist, distributed firewall and more. - Extend Istio service mesh beyond containers to bare metal servers and virtual machines in a multi-cloud, multi-cluster, multi-region environments. - Drive observability and analytics with real-time monitoring, tracing, and application mapping. With growing adoption of container ecosystems, Kubernetes and OpenShift are becoming easy and popular choices for enterprises today. This webinar will look at the bigger picture by exploring all the components necessary to deploy a production-ready container-based application. Assess and understand how the rise of multi-cloud and microservices are ushering in the next-generation of load balancing solutions. The Microsoft Azure Cloud is the cloud platform of choice for many enterprises in their digital transformation journey. Migrating applications to the public cloud require strategic considerations for application networking services, like load balancing, visibility, and performance monitoring. Register for this webinar to learn how Avi’s Intent-Based Application Services Platform helps Adobe deliver its digital experiences on Azure. According to RightScale, 81% of enterprises have a multi-cloud strategy and operate 5 clouds (public and private) on average. So how are businesses handling enterprise-grade load balancing, monitoring, analytics and security of their applications, which are increasingly deployed across on-premises data centers and multi-cloud environments? Avi overcomes the limitations of appliance-based or single-cloud solutions which work only in one environment. Deployment flexibility - deliver the same enterprise features and consistent experience across any environment and with any delivery options SaaS or customer-managed. Enterprises are adopting multi-cloud strategies as springboards to increased business agility and competitive differentiation. Elastic, highly-automated application networking services such as load balancing, application monitoring, application acceleration, auto-scaling, micro‑segmentation, and application security, are essential components to deliver this agility. - Learn how software-defined application networking is improving business outcomes. - Understand best practices for delivering modern applications across clouds. - See how ZOLL Data was able to automate application delivery in Amazon AWS. Considering moving your data and applications to the cloud? Tune in to learn why Swisscom can deploy services within minutes instead of weeks, using OpenStack and Avi Networks. Learn how Swisscom overcame challenges such as ensuring HA with no single point of failure, achieving zero packet loss in the NFV cloud with multicast traffic and low jitter, and more. With modern technologies on the rise, enterprises are increasingly favoring container orchestration platforms like Red Hat OpenShift for their flexibility and developer-centric features. Unfortunately, traditional application delivery controllers (ADCs) limit microservices architectures with inflexible architecture, static capacities, and lack of enterprise-grade features. With Avi, you can harness the potential of modern container services with a full-featured application services platform that offers multi-cloud load balancing, analytics, observability and visibility, automation, security, and much more. For years, enterprises have relied on appliance-based (hardware or virtual) load balancers. Unfortunately, these legacy ADCs are inflexible at scale, costly due to overprovisioning for peak traffic, and slow to respond to changes or security incidents. These problems are amplified as applications migrate to the cloud. In contrast, the Avi Vantage Platform not only elastically scales up and down based on real-time traffic patterns, but also offers ludicrous scale at a fraction of the cost. 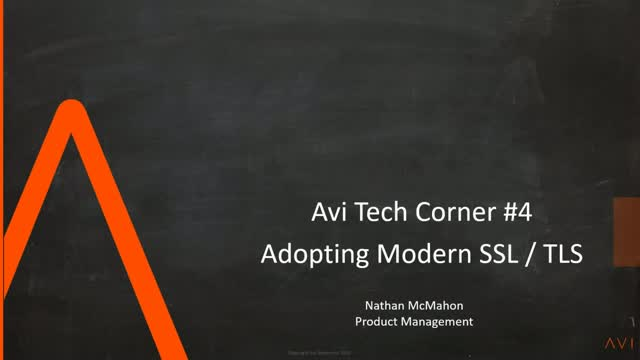 Watch this webinar to see how Avi can scale up and down quickly on the Microsoft Azure Cloud. Matt Karnowski, Solutions Architect & Lei Yang, Director of Product Marketing, Avi Networks. Analytics and data are at the root of better decision-making and automation. Today's agile application environments require IT to troubleshoot issues fast and automate common application delivery tasks. Splunk helps enterprises all over the world make better decisions with their machine data. Avi Networks delivers an analytics-driven platform for highly-automatable application networking services. Together, the solutions deliver a powerful complement of analytics services that help IT administrators deliver better services. The joint application is available for download from the Splunk Marketplace. Whether you deploy applications on-premises, in the clouds, or both, only Avi Networks provides consistent, enterprise-grade load balancing for ALL your applications across ANY data center, ANY cloud or ANY hybrid environment, and includes container support for OpenShift and Kubernetes.